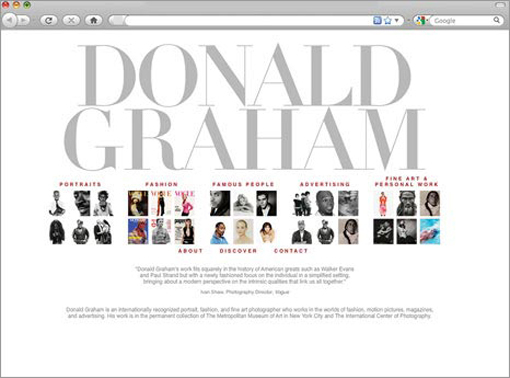 When crafting this Flash site for renowned photographer Donald Graham, we aimed to visually delight his visitors. We designed a glamorous site that showcases his work and speaks to his audience of creative directors, art buyers and museum curators. Mr. Graham’s work can be seen on the covers of Vogue magazine, Vanity Fair and American Express commercials, just to name a few. Concerned about search engine ranking and the use of Flash, we created workarounds for him, optimizing the site so that he would not lose his top position on Google.